We like unusual things here. There's nothing better than finding that perfect present for someone who is difficult to buy for. 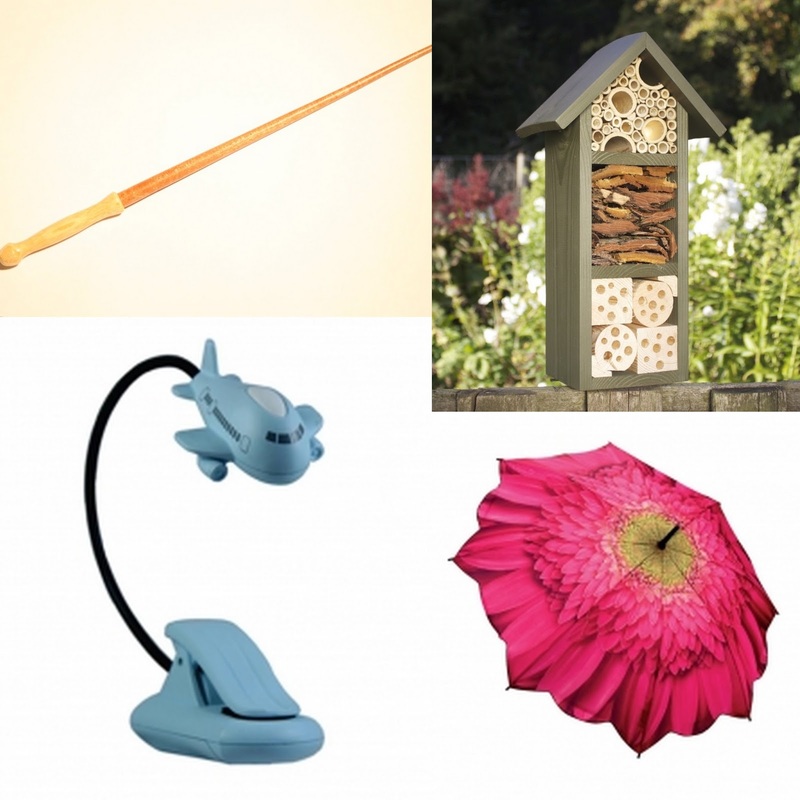 Peach Perfect is a website which specialises in 'perfectly inspirational gifts'. Here you'll find the unusual and sometimes eccentric, there are some items that are generally quite hard to find dotted amongst a few more everyday and traditional gifts. If you are tempted by a Bee Hotel, a Handmade Wooden Wand, a Gerbera Umbrella or Airplane Nightlight then you are probably in the right place! Even though the range might be really varied, the Peach Perfect website is actually not over-crowded or difficult to navigate, so it's easy to spot something which takes your fancy. 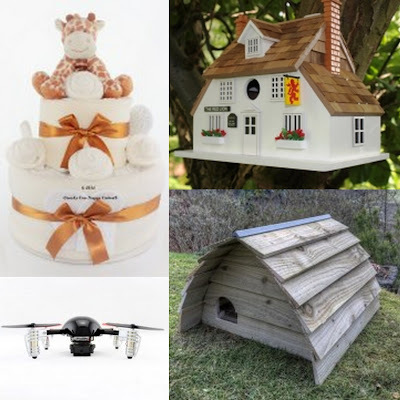 My favourite thing on the whole site is the Hedgehog House, and my partner quite fancies the Extreme Fliers Micro Drone 2!! I have a couple of friends who would appreciate the Nappy Cake and the Red Lion Pub Bird House too! 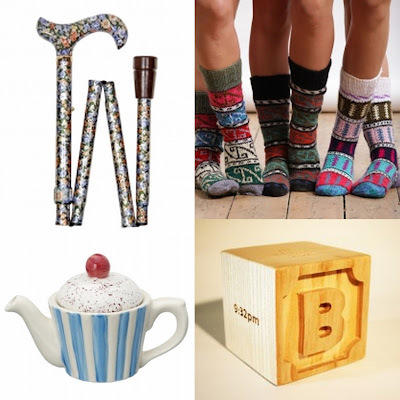 For simpler, more traditional tastes why not the Wooden Birth Commemoration Cubes, Cup Cake Teapot, Folding Walking Canes or Turkish Socks. Peach Perfect really do have something to amuse and delight everyone. Awesome as all of those gifts are, they're unusual, and won't be to everyone's taste. Peach Perfect have chosen a more sensible prize from their website to give away to one of my readers. One of my favourite handy toys has always been a pop up play tent. Perfect for the under 5's to protect them from the sun while they play outdoors in good weather, great as a den for book reading and a house for imaginary play, they fold up out of the way in seconds. Peach Perfect have 2 different Play Tents on offer, and they are giving one away to one of my readers. The winner will be able to choose which prize they'd like from the Garage Play Tent and the Dolls House Play Tent. 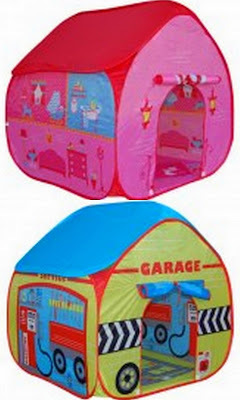 The pop up tents are made by Pop It Up, retail at £23 each and are suitable for children aged around 1-5. Each has a built-in groundsheet with a print that matches the theme (the garage has a road map), and comes with it's own carry case. To be in with a chance of winning the random draw, enter using the Gleam form below. If you are new to Gleam or can't make it work, there is a link to a really good guide on my giveaways page. The giveaway will close at midnight Sunday 28th February and the winner notified by email. Please see the bottom of the Gleam form for terms and conditions. UK entrants only. Love the look of the Decorative Bird Feeders! I think the Hedgehog House looks fantastic, thanks for the lovely giveaway. The Extreme Fliers Micro Drone 2 Quadrocopter with camera looks brilliant! I love the Happy Hopperz! I would get my youngest the XL Happy Hopperz! Would love the Lion backpack for Florence she does love her cuddly toys so would adore this to put her books in. The Telephone Box Decorative Bird Feeders Look fabulous. I entered *then* saw UK only. GAH. Sorry about that. I love the Personalised wooden names, our baby is due on Wednesday! I like the nightsafe emergency light, I can never find candles or anything if the power goes. I'd love to receive the Forgotten Skills of Cooking book - it's right up my street! i would get the Birth Cubes, for all my children. All the Turkish socks, they look lovely! i like the happy hopperz! It would be an Extreme Fliers Micro Drone 2. I've always wanted one of these. Many wonderful things to choose from. The hedgehog house would inspire the gardeners. The glass balls and hearts are exquisite. I like the idea of the Spirit Balls. I have never seen them before. The Happy Hopperz, our whole family would have so much fun with those! I'd choose the Hedgehog House. My daughter would love watching out for them in our back garden. the 'its a boy'/'its a girl' friendship balls are really cool! I love the Happy Hopperz, my son would have so much fun with this! My son Oscar would love the Happy Hopperz! I'd buy a Hedgehog House!